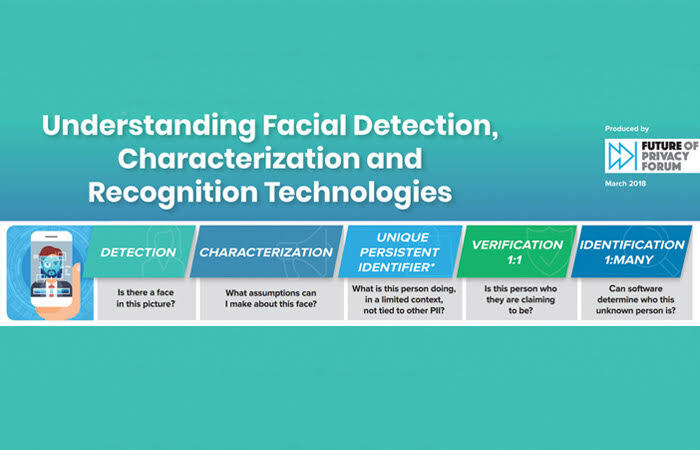 Today, FPF publishes the infographic Understanding Facial Detection, Characterization, and Recognition Technologies along with Privacy Principles for Facial Recognition Technology in Consumer Applications. These Principles define a benchmark of privacy requirements for those commercial situations where technology collects, creates, and maintains a facial template that can be used to identify a specific person – enabling the beneficial applications and services, while providing the necessary protections for individuals. Government use of facial recognition technology has drawn a great deal of recent attention: in border control, in law enforcement, and in combatting terrorism. Others have published extensive reports on these topics. Some companies have called for regulation of how governments use these technologies, and others have refused to license the their facial recognition systems to the government until racial disparities and other accuracy challenges are overcome. Many have criticized the US government’s failure to ensure the fairness of its own biometric systems and protested law enforcement agencies who seek exemptions from long-standing accuracy requirements. FPF agrees that we need public discussion and thoughtful regulatory action regarding government use of facial recognition technologies. These important issues deserve careful consideration and action in the context and history of government surveillance, algorithmic fairness, and equity; they are beyond the scope of our Privacy Principles for commercial use. We do not make recommendations regarding these issues in the publications we release today, but look forward to participation in the important policy discussions with civil society and government that are necessary. The consumer-facing applications of facial recognition technology continue to evolve, and the technology will certainly be used in new ways in the future. FPF’s Privacy Principles for Facial Recognition Technology in Consumer Applications includes seven core privacy principles that address the concerns surrounding personally identifiable information (PII) (templates of individual faces) collected by these systems. We expect these Principles will be used by companies as a resource for the development, refinement, and implementation of facial recognition technology in commercial settings. As more retailers and private companies increasingly employ various levels of facial scanning technology online and in person, and as applications for photo organizing, tagging, and sharing grow, it is time to push for greater consensus on what the appropriate privacy standards should be for commercial use cases, and what protections consumers should reasonably expect. Equally relevant is the need to expand stakeholders’ awareness and understanding of the many types of facial scanning systems, as well as the impact of accuracy differences among the many systems available today. It is important to understand the distinctions between facial detection systems (which when properly designed neither create nor implicate any Personally Identifiable Information) with full-scale facial identification programs (matching a person’s image to a database in order to identify the individual to a store clerk or stadium employee who otherwise wouldn’t recognize them). FPF’s graphic Understanding Facial Detection, Characterization, and Recognition Technologies summarizes the key distinctions between facial scanning technologies for easy reference. Relating each technology to its common use cases, benefits, concerns, and risk of identifiability, we have also outlined the minimum recommended notice and consent requirements and the Operator’s responsibilities. In the case of facial characterization, for example, no PII is typically retained. However, characterization technologies can inform businesses whether individuals are smiling or frowning, male or female, and old or young. That means people may be treated differently – men and women may see different ads displayed on a sign, or there may be customized offers for parents or older individuals – in which case it’s important to understand that the system has been tailored to identify characteristics but not a unique identity. In these cases, notice is the key requirement, as well as attention to ensure there is no discriminatory activity. But in the examples that do involve creation of facial templates and identification, the guidance calls for increasing levels of consent.